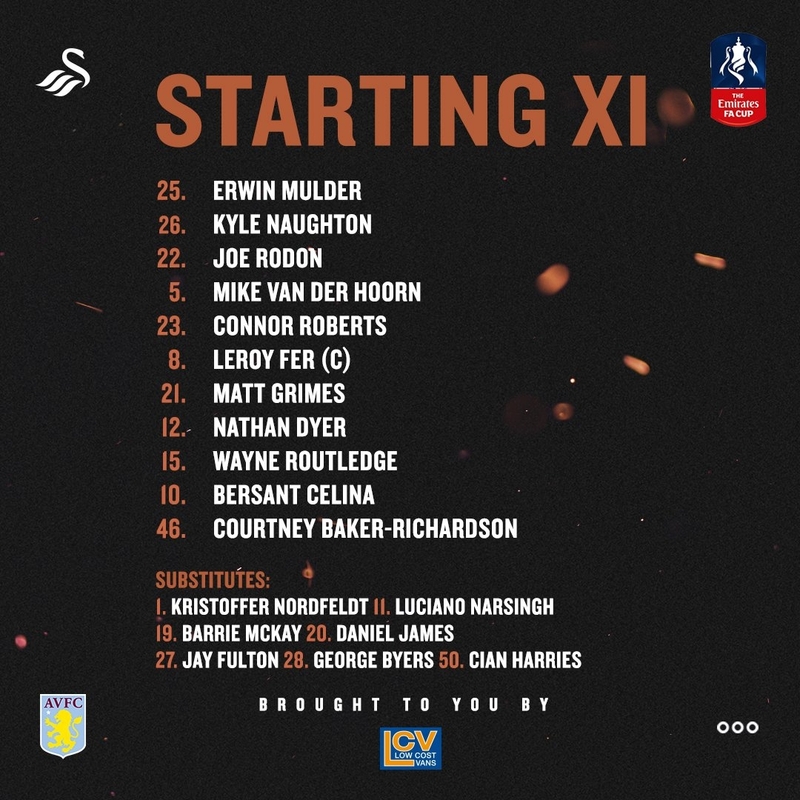 This is the place to discuss all things related to the Aston Villa v Swans - FA Cup 3rd Round game on Saturday 5th January 2019. The referee for the game is Gavin Ward. If you're planning on going to the game, have a read of our Travelling Jacks Guide to Aston Villa. Have a browse of the Aston Villa v Swansea City Head to Head Statistics from 1936, right up to our last visit in October 2018. I'd give Grimes a rest. He has played nearly if not every game this season. Bony must play too. he needs minutes on the pitch and a shop window. Bony, Oli and Jeff all have a bug which is going around the club. All sat out of training today, and are very doubtful for Saturday. I'd like to see us play the strongest team that we have available. So I'd prefer us to go for it. So would I Jeff but I can't see it happening. But you never know with Mr Potter. But what I do want us to do is play free, attacking football and be entertaining. As disastrously proven at the Spurs QF last season, when we achieved our best progression for 54 years, I no longer think the club place any merit in the FAC. Swans are far from being alone in this strategy, which started in the mid 90s when ManUre were excused to play in the World Club comp in South America or Japan or somewhere equally remote. I think even Tranmere also picked up on this last night. If they are looking to get rid of Nathan or Wayne, then I'd be amazed if they were played. Unlike Bony, they are unlikely to go abroad, so they wont want them potentially cup-tied, as that further limits the market for them - which will be Championship level and possibly PL for Nathan. Who's going to sign Bony? He's always crocked, looks well short of fitness and his wages are huge. Reading at Man Utd. Half time. Reading 63% possession to Utd's 37. 4 shots each on goal with 2 on target for each. Utd zero corners Reading 2. Guess the only stat that matters is Utd 1-0. Pretty amazing performance from the team we just trounced. That's a full strength side. Oli, Bony and Jeff all sick this week. Not surprised none are in the squad. But to see Luciano on the bench ahead of Asoro, shows how far he has fallen down the pecking order! No CCV on the bench. that to me is the best indicator that he's going to be recalled by Spurs, and then sent on loan elsewhere. Is this the first time in forever that a non league team isn't in the 3rd round? I'm really pleased potter has picked his best team. Let's get into the fourth round. Would love to see narsingh get a run out today too. Narsingh is in the squad as we have no other fit striker. If he comes on it will be for CBR I expect.